I tend to self-sabotage myself. I often go back and to in my head, arguing with myself over things. One of the things that I argue with myself the most about is 'going out'. I seem to have a hard time letting myself have fun sometimes, I guess. I'll sit and over think every possible situation and outcome. I tell myself that if I go out then i'll probably end up wanting to come home, but then I tell myself that if I don't go then I'll be left out and feel completely out of the loop and like a party pooper. I can't really win. I used to constantly say 'no' to things. I was saying 'no' out of fear and anxiety and not necessarily because I didn't want to go. Nowadays, I try and do as many things as I can. I push myself to go out, I tell myself 'what've you got to lose?' and most of the time, I never regret taking the plunge and going out. I think it's important to fight through your fears and anxieties, especially if they stop you from doing something fun and something that you might enjoy. Yes, things could go wrong. Yes, I could get there and have crippling anxiety and a panic attack. BUT, I could also go and have the time of my life and laugh a hell of a lot. You just have to tell yourself that it's worth the risk. With it being the time of year where invites to Christmas parties, events and New Year celebrations are floating around everywhere, I just want to encourage people to not be scared to let themselves have a good time. This time of year, we should all be feeling words like 'merry' or 'jolly' and not ones like 'scared' and 'lonely'. Go out, push yourself and have fun! It might seem terrifying (I get it, I've been there and sometimes I still have to push myself too), but you never know until you really try! Anyway, despite anxiety sometimes rearing it's ugly head, I've always loved a good party, a fun celebration, those festive times of year. I've always loved the love, the laughter and the fun that can fill a room. I've always loved the outfits, the getting dressed up and the glitz - there's nothing better than it sometimes, especially at this time of year. Party season is in full swing, and I don't know about you, but I'm totally ready for it. I love getting dressed up and finding that perfect party outfit. I'm the kind of girl that likes to get dressed up on Christmas Day and that loves to whip on a pair of high heels and feel glam. Often, I find myself trawling through website after website to find that perfect dress or pair of trousers that are exactly like the ones I envisioned from nowhere in my imagination. This year, I've had a little bit of help. Dorothy Perkins (a brand which makes me have all the bloggy feels and nostalgia) kindly contacted me and asked me to be a part of their fabulous Dress To Party Christmas Campaign. Of course, I said yes and I got to choose my own Christmas party outfit to style for myself. 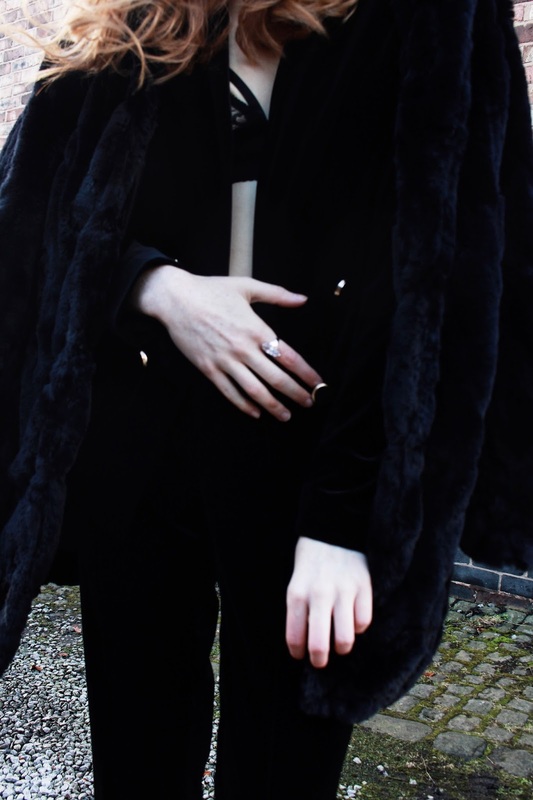 I chose to style this amazing Black Velvet Blazer and Trousers, as well as this gorgeous Faux Fur Coat and Rose Gold Oval CZ Ring. I've always loved co-ord suits as party-wear but never taken the plunge to wear one myself. I knew I just had to take the plunge this time. Velvet is something that is SOOOO 'in' this Autumn/Winter and that is just something that makes this co-ord even more exciting for me too! I thought it'd be super fun to combine the two different textures of the faux fur and the velvet, and also decided to throw in some metallic vibes with my jazzy new shoes too! I thought the suit looked super sassy with just a simply lacy black bra underneath and the addition of my fabulous Moschino clutch worked perfectly. This is honestly one of my favourite looks ever I think!